I’ve wanted one of these for a while but can’t choose between Stainless Steal or Aluminum. I’m leaning towards the SS because it’s thinner. Feedback from those who already have one would be appreciated. I'm going with 6" SS Combo at least...maybe full set. I've had the 6" aluminum one for few years now. This is my "go-to" rule. I use the depth stop feature all of the time. Here are two minor issues with the aluminum. 1) Since it's somewhat soft material the corners are wearing a bit. 2) It's a bit thick to precisely mark from. I may give the stainless a try again. I ordered a set of three stainless when they offered them before but I could see a few tell tail grind marks in the base metal. In the right lighting this made the tick marks difficult to see so I returned them. Think I will call them and see if they have the same metal processing as before. For the price they should be flawless. Stupid question, why the two locking knobs? Owning both the Kreg multi tool and now the Paolini, my guess for the second knob is due to the design to keep the 'collar' square to the rule. Thanks Matt, if I understand the collar can go skew if not both screws are touching the rule right? I was wondering because i know you can use the collar/stop to make the rule to stand on it's own so I was thinking perhaps a double purpose for both screws. AFAIK the screws do nothing when the stop collar is used to hold the ruler up for measuring. I picked up a special version of this SS rule during my class last week with Greg. Only sold to students and it was a bit cheaper than from Woodpecker. Or astronomically more expensive if you factor in the class cost. I purchased the original aluminum version in 2011 when they first came out. It was pretty handy but the blade thickness was always an issue. I then purchased the stainless version when it was released about 3-4 years later. What a huge difference. I actually now use the stainless version quite often and also purchased the metric version. I sold the aluminum Paolini immediately after receiving the stainless version. Interesting, I bought the SS one from Greg when I took his class. He only had the SS ones available for sale but the aluminum one we used in the class. When WP first introduced the Paolini rule the first time I thought yea right a gimicky tool. After taking the class from Greg and using it like I said I bought one from greg right in the class. This time I bought the set of aluminum ones. I liked the feel of the thicker material. I have a 12” aluminum combo scale and a 6” imperial stainless. I hardly ever use the aluminum, but do like the stainless. Any disadvantage to combo over having a separate metric and separate imperial? Seems a slightly poor relation to a combination square, what advantage does it have? I'm possibly missing something here but a combination square is pretty much standard fare for carpenters over in the UK. Personally I carry a 150mm one in my toolbags cos it does 90% of what I need then I have a 400mm one in my cordless drill box. The 300mm ones are OK but I find if I carry one in my toolbag it jabs me in the leg/side/tummy when I bend down. I got sick of the darn thing. Possibly the workshop wallahs find things different? There are sooooo mannnny similar set ups on the market, and many for much less $$. One could just use a Starrett combination square. It does the same thing! Remove the blade and you can use the end as a height gauge as well. Honestly, I usually grab a combination square most of the time. @demographic The main attraction for me is how light and slim it is compared to a combination square (6”). I can slip it in a pocket and it’s always close at hand. That Lee valley rule stop Derek posted is a great alternative. Actually I prefer using the Starretts for the workshop. As long as I have a bench to lay them on, I'll use the 12" Starrett and the 6" Starrett and for some jobs use both of them at the same time. Where the Paolini works well is when you need to carry it in a shirt/apron pocket or when using it on a ladder or scaffolding. The Paolini also works well in wet/damp conditions which I would never subject a Starrett to. I've ruined a 12" forged Starrett and cracked a 6" cast Starrett when they slipped out of a pocket/toolbelt and bounced on the concrete. For accuracy the Starrett can't be beat but the Paolini does have a niche to fill because of it's size, weight and materials of construction. If you take a class from Greg you will use his rule. thats what sold me one it. 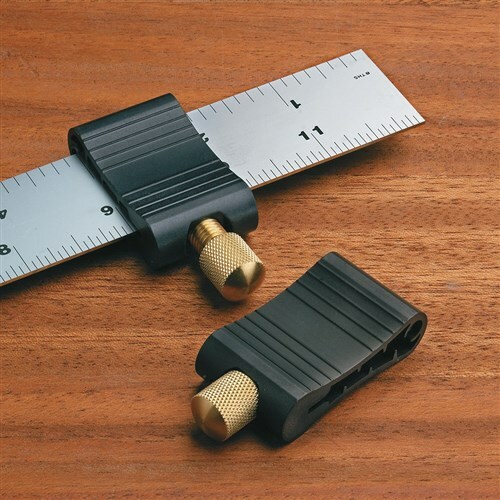 I dont know of any rule that can be set on edge in its own stand which really comes in handy along with the scale on the end to set router bit and saw blade height . I think Im going to change my order to all stainless today. What makes you think that yo cannot do that with any other rule? It does not have to be aligned on the horizontal. The inch or metric versions have the scales inverted on opposite sides, so you don't have to flip it over, just read the opposite side. The combo, you might need to flip it over so that it reads right. I don't really recall this being a problem. I don't use the combo one that much, really only when I need to read metric; because it is my best metric ruler. I just think that the 6" smaller stainless form factor is where it excels. It's always on my bench, and I either grab this one or a saddle square if I want to go over a corner. I look at it more as an advantage than a disadvantage in that it's easier to NOT make a scale-related mistake. well dont buy one if you dont find value in it. I bought the aluminum 6" version a few years ago when they offered it. To me, it is one of the most handy little measuring devices to keep handy in my shop apron. The advantage to me is that it is small enough to fit in a pocket, yet handle the vast majority of my measuring/marking needs when I am playing in the woodshop. I like the notch for the pencil and the quickly adjustable stop for marking my lines. There may be better tools for a job, there may be cheaper tools for a specific job. But as an all around handy measuring/marking tool I can keep in the pocket of my apron, I am very happy with mine! I will buy some of the stainless ones (still haven't decided which ones yet - combo marked or individual sets) as I have dropped my aluminum one a couple of time and dinged up the corner. I will also order a couple to give to my son and my nephew as i think they are that handy! The best tool is the one you actually use!! @daddyscott2001 - once you get your new ones you should send your dinged up aluminum one back to them. I have heard that they are terrific about repairing damage. Just check into it. @Alanbach thank you! It isn't that bad yet, but I'm sure I will drop it some more!! I will keep that in mind, thank you! Like others, I like marking tools. Sometimes it does not take much persuading to buy one! On the other hand, the temptation can also make us stop thinking how we use tools, and many on offer are a solution looking for a problem. @derekcohen , the woodworking field is indeed with many items that are designed for the 1% usage and also impulse buying. That being said I might consider the pocket rule even though I have so many internal personal issues with the company producing them. Well that’s an interesting statement Peter as I’ve always considered WP to be rather like a kindered spirit to Festool. They’re both locally owned, quirky, family controlled manufacturing facilities that do have their own very strange marketing strategies from the Woodpeckers One Time Tool to the Festool “let’s eliminate all aluminum cutting options on all of our saws for the USA”, and while we’re at it, let’s eliminate the accessories for the 1010 router to boot. mine came in the mail yesterday. I ordered the set. I did call and requested they changed my order to stainless rather than Aluminum. However my order was the aluminum ones. No biggie to me, they didnt charge the difference so Im good. they looked very well made took them and hung them on my WC. I got my 6” stainless combo in the mail yesterday as well. It came much sooner than I expected which is great.